Windsor Castle is a British Royal residence located about 22 miles from Buckingham Palace, the monarch’s official London residence. Because of the relatively close location to the city, Queen Elizabeth frequently spends her weekends there when she is not required to be in London for formal appearances or special occasions. In Windsor Castle Part One, I will discuss the history of Windsor Castle which dates back over 1000 years to when it was built shortly after the Norman Conquest. In Part Two, I will discuss the architecture of the main buildings and give a short tour of some of the rooms inside the castle as well as St. George’s Chapel and the surrounding grounds of Windsor Great Park. Windsor Castle was built by William the Conqueror when he was establishing a line of defensive fortifications around London shortly after the Norman Conquest in 1066. 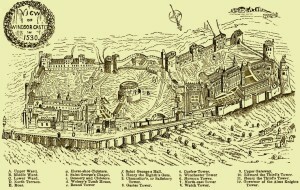 The site for Windsor Castle was located within an easy 20 mile march from the London and conveniently positioned on the River Thames, which at the time, was a main medieval route through England. The castle was also located near Windsor Forest which had been a royal hunting preserve used by the previous Saxon kings. The first building constructed on the site was a wooden structure known as a keep, which is a fortified tower built within a castle, set on the top of a man-made mound and protected by an outer wall. A second structure was later built to the east forming what is known as the Upper Ward and several years later a third structure was built to the west, known as the Lower Ward, thereby enclosing the entire castle. The first royal resident to use Windsor Castle was King Henry I (reign 1100-1135). During his time, the mound on which the original keep was built had begun to collapse and it was reinforced with timber supports and stone, also a low protective wall was added. Later, King Henry II (reign 1154-1189) ordered an extensive refurbishment of Windsor Castle. The original wooden keep was completely replaced with a stone structure and the mound was again reinforced with a new massive stone foundation. The wooden walls surrounding the Upper Ward where replaced with a stone walls and the King’s Gate was built. The interior castle buildings were also completely reconstructed in stone. Then, during the reign of King John (1199-1216) Windsor Castle was besieged, meaning armed forces surround the castle, in 1214 during the time known as the revolt of the English Barons. From Windsor Castle, King John held negotiations to settle the disagreements before he eventually signed the Magna Carta in nearby Runnymede in 1215. A year later, the castle was again under attack by the baronial troops which were then aided by the French, Windsor Castle held and the outside forces were defeated. But, during the second siege, the castle was severely damaged and extensive repairs were required to strengthen its defenses, the construction lasted from 1216 to 1221. At that time, the stone walls of the Lower Ward were rebuilt and three new towers were constructed; the Curfew, the Garter and the Salisbury towers. The Middle Ward was also heavily reinforced and an additional stone wall was built with the Edward II tower at one end and the Henry III tower on the other end. King Henry III (reign 1216-1272) built a lavish palace in the Upper Ward in the years from 1240 to 1263 and Windsor Castle eventually became his favorite residence. New buildings were built in the Lower Ward which included the Lady Chapel, a large 70 foot long chapel built on the south side, and repairs were done to the Great Hall with a new kitchen; but unfortunately the Great Hall was destroyed by a fire in 1296. With these new changes made to Windsor Castle there became a distinct division between the Upper Ward which became an area that was part of the royal family private residence and the Lower Ward which provided a public space for royal ceremonies and other events. During the reign of King Edward III (1327–1377) he established the Order of the Garter in 1348. Since Windsor Castle would be the headquarters of this new order, the King planned to have the castle completely renovated to reflect a more lavish style. Between 1350 and 1377, an exorbitant amount of money was spent on the construction of the new castle and on the interior design with expensive furnishings and other decorations. In addition, three new buildings were built; the Little Cloister, King’s Cloister and a Kitchen Court in the Upper Ward. In the front of the main portion of the castle; the St. George’s Hall, the Great Chamber and the Rose Tower was constructed and designed for the king’s private use at the west end of the castle. In the Lower Ward the Lady’s Chapel was enlarged and renovated. At the beginning of the 16th century, the young King Henry VIII (1509-1547) was in power. 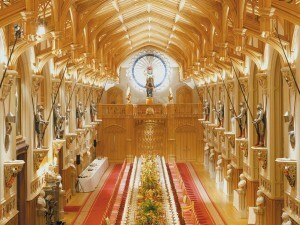 In addition to Hampton Court, King Henry also frequently visited Windsor Castle. In keeping with his active lifestyle of hunting and jousting, the king also enjoyed the game of tennis and he had a tennis court constructed near the base of the mound near the Round Tower in the Upper Ward in 1510. Originally, due to his close association with Cardinal Wolsey, the King had commissioned the Lady Chapel to hold an elaborate mausoleum built for his closest spiritual and political adviser upon Wolsey’s death. After Wolsey’s failed in an attempt to seek an annulment for the King and his first wife, he quickly fell out of favor and was eventually striped of his power. He died at Leicester Abbey before his scheduled execution and was buried in the abbey’s church. The mausoleum was never completed and when King Henry died in 1547 he was buried in a vault under the floor originally intended for Wolsey and it is marked by a simple black gravestone in the Lady Chapel section of the St. George’s Chapel at Windsor Castle. In 1642, as England broke into a Civil War, Parliament became concerned that the troops of King Charles I (1625-1649) would advance on London and Windsor Castle was seized to protect the route along the River Thames. Unfortunately, with troops occupying the castle, looting of many valuable gold and silver items were taken including the unfinished tomb of King Henry VIII. Eventually the Earl of Essex used Windsor Castle as his headquarters and also parts of buildings were used as a prison to hold captured Royalists and the Lady Chapel held guns and ammunition. In 1647, King Charles was taken prisoner and brought to the castle under house arrest before his execution in 1649; he was later buried in St. George’s Chapel. At the beginning of her long reign, Queen Victoria (1837-1901) and Prince Albert made Windsor Castle their principal royal residence and it was frequently used for entertaining foreign diplomats and nobility. 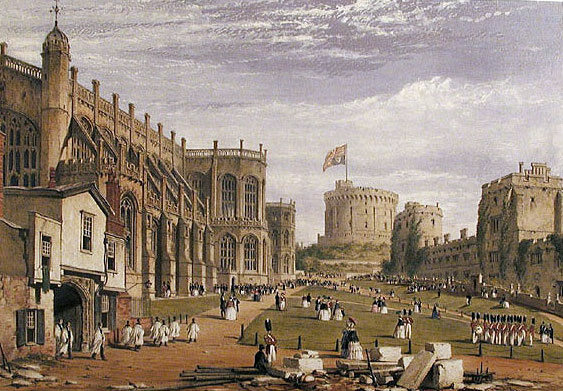 One major change to Windsor Castle came in 1848 when Parliament passed a law which limited public access to the grounds of the castle and roads were re-routed or closed within Windsor Park to allow a measure of privacy for the Royal family. 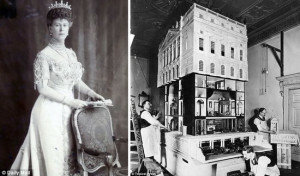 Modern improvements were eventually made to Windsor Castle during this time with interior running water provided by a nearby reservoir and initially only limited electric lighting was installed because the Queen preferred candlelight. 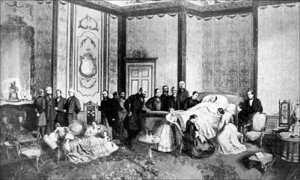 After the death of Prince Albert in December 1861, Queen Victoria made the room where he died a shrine and in her state of exaggerated mourning she ordered that it remain unchanged until her own death several years later. Ultimately an elaborate mausoleum was built at Frogmore in Windsor Park as a lasting tribute to the Queen’s beloved husband and that it where his body is interred. After the death of Queen Victoria in 1901, her son became King Edward VII (1901-1910). The British monarchy moved from one that had been suspended in a period of prolonged mourning with a relatively somber court to one that became extremely active with almost constant activity and entertaining. As a result Windsor Castle underwent a massive interior redecoration which eliminated the Victorian-style clutter and replaced with furnishing in Edwardian-style elegance. Finally, the room were Prince Albert had died and in which Queen Victorian had made into a shrine all those years ago was finally cleared. More modern conveniences were added during this time, such as electricity in all the rooms along with central heating throughout the castle and the installation of telephone lines which made communication so much easier and quicker. 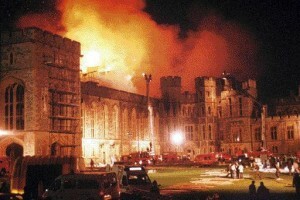 During World War II, Windsor Castle was prepared for war with tightened security. Since the castle would be a major target for the German bombers, the structure was reinforced with sandbags to prevent any significant damage and the windows were blacked-out as a precaution. In addition, valuable artwork and fragile items such as the crystal chandeliers were either removed or stored for safe keeping. Although the King and the Queen remained at Buckingham Palace during the duration of the war their children, Princess Elizabeth and Princess Margaret, were moved to the safety of Windsor during the worst of the German bombings of London which became known as “the Blitz”. The King and Queen frequently joined their daughters at Windsor on the weekends. After the war was over it took several years to restore Windsor Castle, repairing any damages and returning the interior to its former grand style and pre-war condition. After the death of her father, Queen Elizabeth II (1952 to the present) decided at the start of her reign that she and her family would frequently spend weekends at Windsor Castle when she is not required to be in London for formal appearances or special occasions. 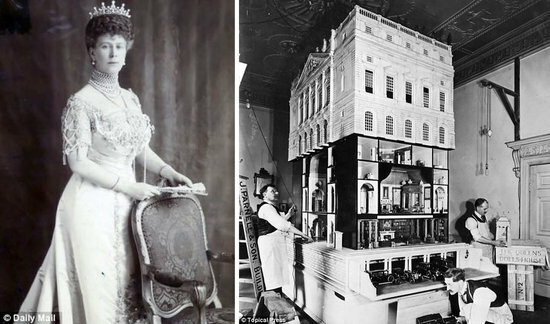 Throughout the years, she has ordered continued maintenance of the castle and when necessary minor repairs to the exterior of the buildings as well as the grounds and periodic renovations of the interior rooms of the castle. Then on November 22 1992, Windsor Castle was severely damaged in a major fire started while the Private Chapel in the State Apartments was being renovated. It has been reported that a work light had fallen and set fire to the curtains near the altar causing the fire that would quickly spread to other areas of the castle. 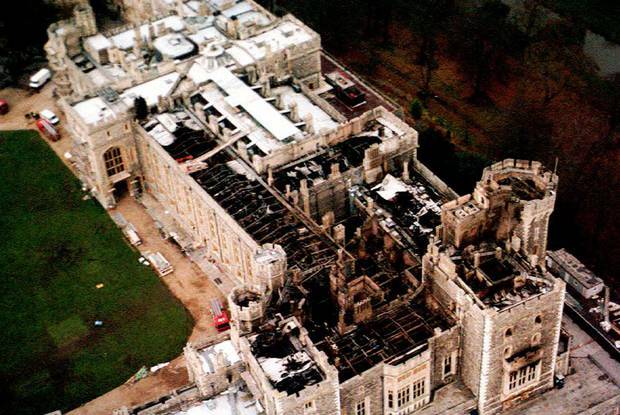 More than 200 firefighters battled the fire for over 12 hours and in the end nine State Rooms had been extensively damaged and several other rooms also sustained minor damages, it was the worst disaster in the castle’s history. Luckily when the fire was first detected the castle staff was able to empty the rooms of many valuable paintings and decorative pieces. 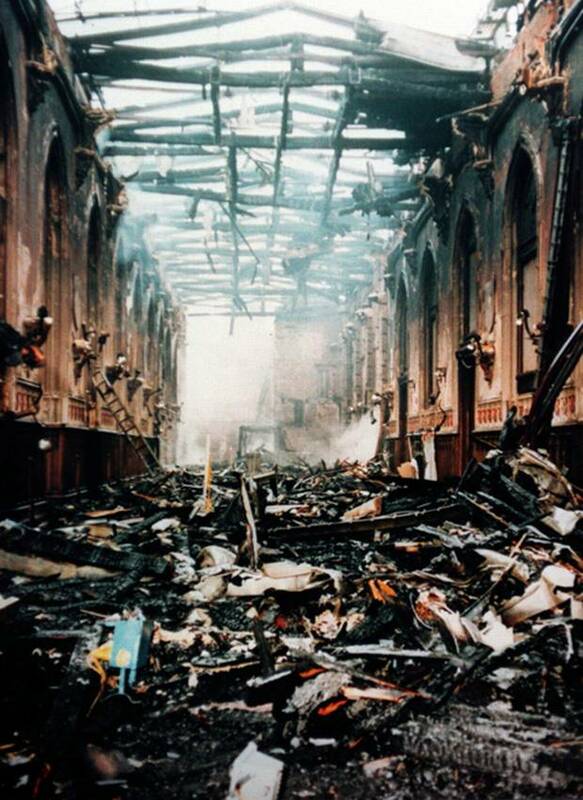 The five year restoration was very costly and at first it was said that the British taxpayers would finance the project but the public was outraged. Ultimately, it was decided that both Buckingham Palace and Windsor Castle would be partially opened for seasonal tours to raise the funds required for the restoration project. On November 20, 1997 Queen Elizabeth and Prince Philip held a ball to mark their 50th wedding anniversary and officially reopen Windsor Castle. 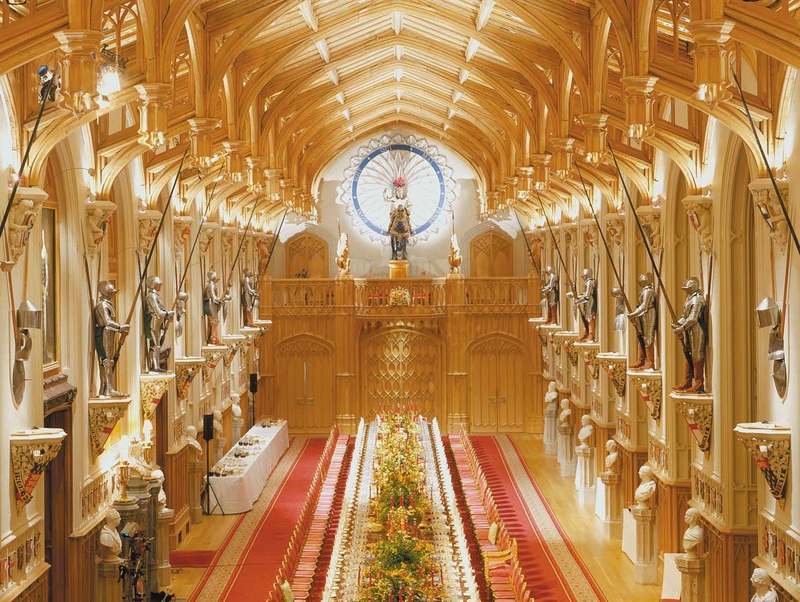 For additional information, please check out Windsor Castle – Part Two which discusses the architecture of the buildings and give a short tour of some of the rooms inside the castle as well as St. George’s Chapel and the surrounding grounds of Windsor Great Park. Personal travel note: When we visited England in 1998, my son and I were able to tour Windsor Castle but not Buckingham Palace. I highly recommend if you have an interest in British history or the Royal Family these tours are a wonderful idea.